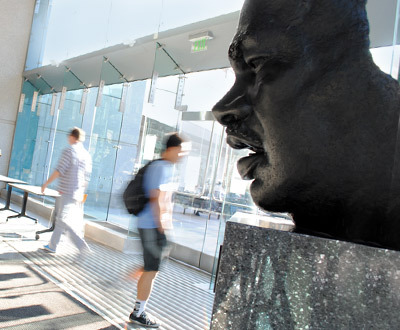 SAN JOSE, CA – The Dr. Martin Luther King, Jr. Library on the grounds of San Jose State University has been closed for the remainder of Monday, Jan. 11. The library is expected to re-open Tuesday, Jan. 12. 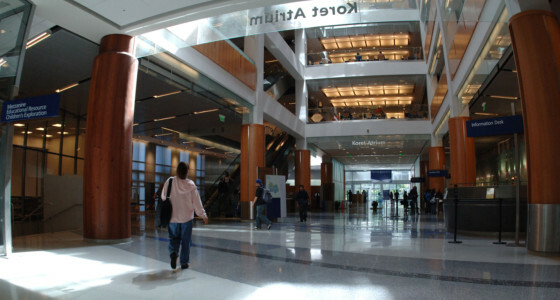 At 3 p.m. Jan. 11, an individual fell from the sixth floor interior atrium to the ground floor. The University Police Department and Santa Clara County Medical Examiner are investigating the death. There is no evidence to suggest foul play or any on-going safety threat. The medical examiner will release the victim’s identity after contacting next of kin. 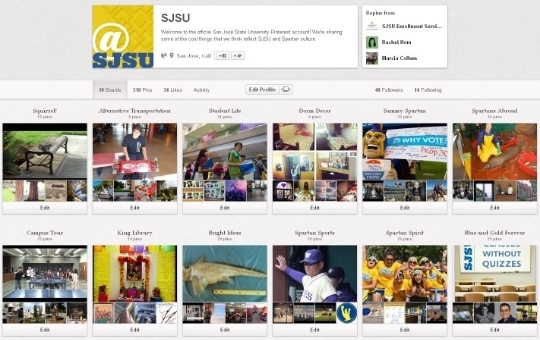 The individual is not an SJSU student or employee. Anyone with information on the case should call UPD at (408) 924-2222. 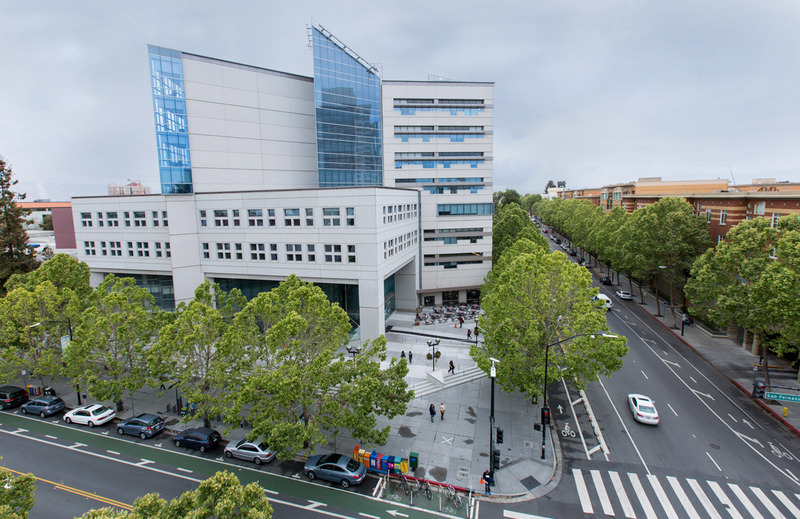 SJSU and the city of San Jose co-manage King Library, which serves the public and all university community members. SJSU is extending condolences to all who have been affected by this tragedy. 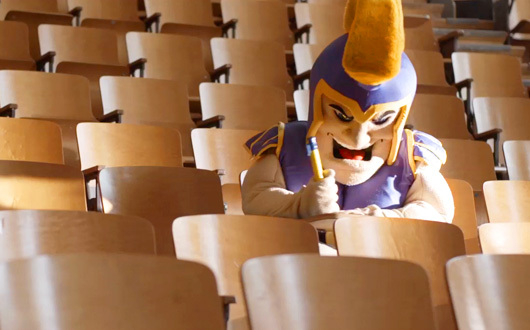 SJSU provides counseling at no cost to students and employees. Students may contact Counseling and Psychological Services at (408) 924-5910. 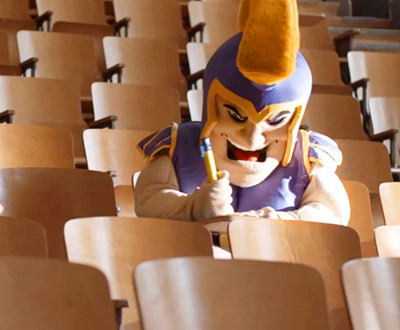 Faculty and staff may contact the Employee Assistance Program offered through SJSU Human Resources at (800) 367-7474. Posted by the San Jose Mercury News on July 2, 2015. SAN JOSE — Jimi Yamaichi was 19 when he and his family were torn away from their farm in San Jose and incarcerated in a desolate, treeless internment camp in northern Wyoming with thousands of other Japanese-Americans after the attack on Pearl Harbor. For Yamaichi and the dwindling number of surviving Japanese-Americans who were forced into the camps, this dark period of American history is an indelible part of their own stories. 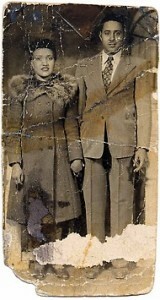 But before their recollections fade with the passing generations, a new project is under way to preserve the family letters, photographs and government documents connected to the World War II internment camps. Over the next two years, San Jose State and 14 other campuses in the California State University system will be digitizing 10,000 documents into a searchable database called the CSU Japanese American History Digitization Project. A $320,000 grant from the National Park Service will soon make these pieces of history available to the public online. Founded three years ago, the SJSU Author Awards have recognized more than 80 members of the faculty, staff and administration who authored, co-authored or edited books (James Tensuan image). SAN JOSE, CA — The remarkable intellectual breadth and depth of the faculty, staff and administration will be on display at the third annual SJSU Author Awards 3 p.m. Oct. 27 in King 225/229. This event is free and open to all university community members. “By presenting a framework for understanding human rights, exploring the complexity of software creation, or delving into the challenge of screenwriting, these authors inform their readers and move them to think in new ways,” said Provost and Vice President for Academic Affairs Andy Feinstein. Each of this year’s honorees will be individually recognized. 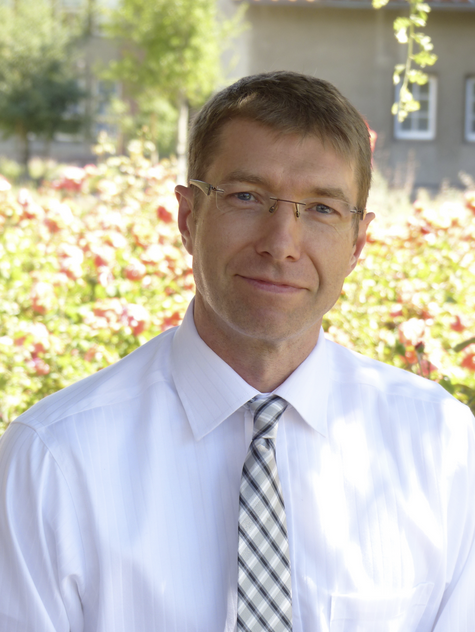 The guest speaker will be Lawrence Quill, chair of the Department of Political Science and author of “Secrets And Democracy: From Arcana Imperii to Wikileaks” (Palgrave Macmillan, 2014). Quill’s work considers the role that secrets plays within liberal democracies and the impact this has on the public’s right to know, the individual’s right to privacy, and the government’s penchant for secrecy and data collection. 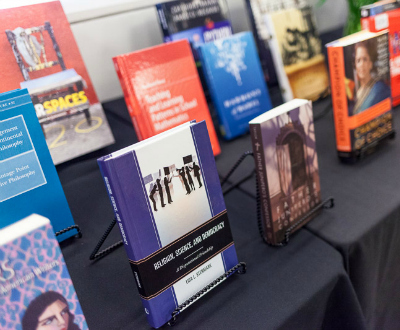 Founded three years ago, the SJSU Author Awards have recognized more than 80 members of the faculty, staff and administration who authored, co-authored or edited books. The Office of the Provost, University Library and Spartan Bookstore sponsor the event. 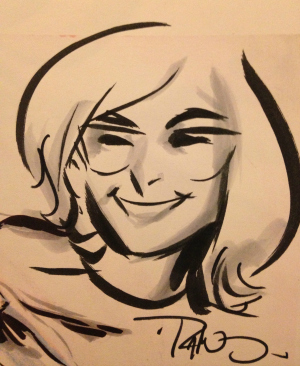 Kathryn Blackmer Reyes, sketched by comic book artist Rafael Navarro (courtesy of Blackmer Reyes). Librarian Kathryn Blackmer Reyes walked into the 2011 Latino Comics Expo in San Francisco and sensed a tremendous opportunity for the artists and for San Jose State. She could see how the comics, meticulously created to authentically incorporate the Latino and Chicano experience, had the potential to inspire all kinds of students, from animation/illustration majors to ethnic studies majors. So Blackmer Reyes began a Latino comics special collection, and this year, the Dr. Martin Luther King Jr. Library will host the 2014 Latino Comics Expo on Oct. 11 and 12. The event is free and open to the public. The expo will include two exhibit rooms featuring cartoonists, writers, illustrators, zine makers and book vendors, as well as panels, presentations and children’s workshops. Latino comics is about far more than eye-catching imagery, Blackmer Reyes explains. 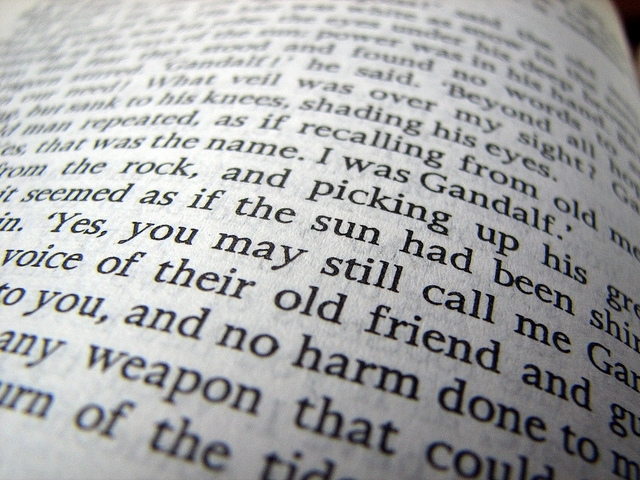 The following was edited for length. Q. Do you need to know Spanish to read Latino comics? A. This is about the U.S. experience so primarily, the text is going to be in English, but the artists are going to incorporate that U.S.-Latino feel. 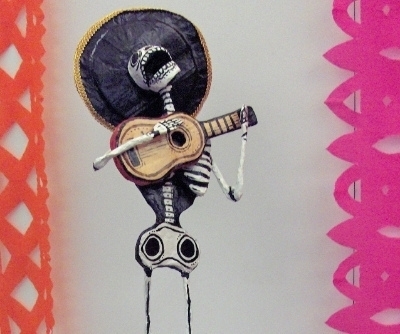 They use a lot of icons, like Lucha Libre, so the art includes pop culture that speaks to many in the vast Latino (U.S. and international) populations. They can be personal stories. We are also getting more women represented in the field and they’re bringing in their stories and characters as well. We are also seeing more indigenous images. I’m asked if this is Chicano Studies and frankly Chicano Studies is anything that represents and speaks to the Latino population regardless of its format. It’s about a people and it’s a story that can be told in the social sciences or the arts and humanities. 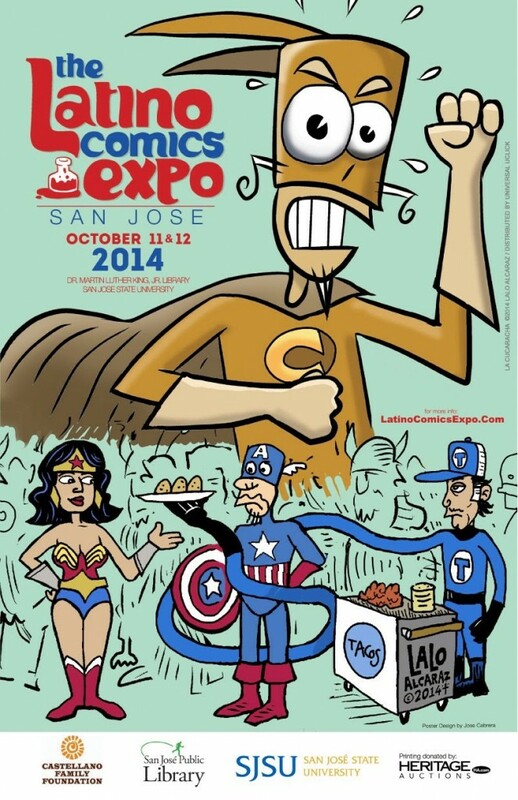 The Latino Comics Expo poster features artist Lalo Alcaraz. A. As a librarian, I am interested in the entire field but when I first discovered this, it was through the Bros. Hernandez, who are considered the godfathers of Chicano comics. Their “Love & Rockets” series is incredibly important. It tells stories of individuals from the barrio. That was my first exposure. Later I was introduced to Lalo Alcaraz who does the comic strip “La Cucaracha,” and who is currently working on a TV show with Seth McFarlane called “Bordertown.” These artists are probably the most successful Chicano comic artists commercially. A. I was born and raised in San Francisco and for my first 15 years, when school was out, I would be in Mexico City for the summer. I completed my B.A. in Chicano Studies at UC Davis. At UC Davis, my professors would send us to UC Berkeley to do research and that’s where I was introduced to my first Chicano Studies Library. Then I went to graduate school for sociology at Binghamton University. I was in a Ph.D. program and found myself showing undergraduates how to do research in the library. I really liked the idea of working in libraries, so on my return to the Bay Area, I entered the School of Information program here at SJSU. Before becoming a librarian here, I worked at UC Santa Cruz and then Sacramento State. 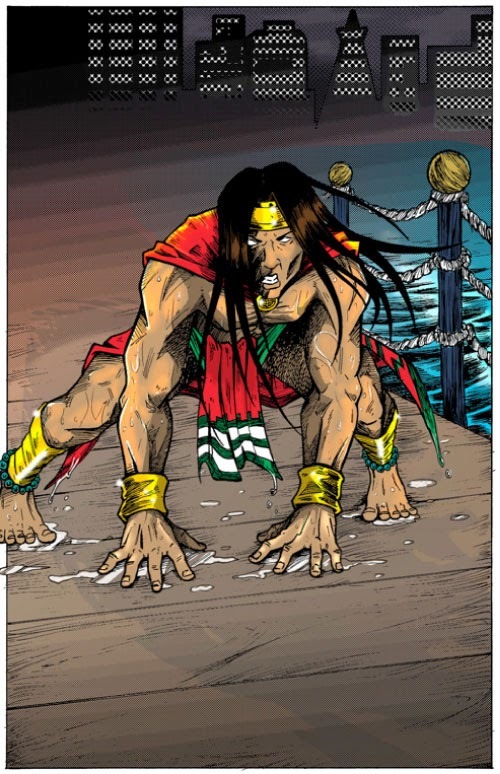 Latino Comics Expo participants will include San Jose native Fernando Rodriguez, who created “Aztec of the City” (image courtesy of Latino Comics Expo). 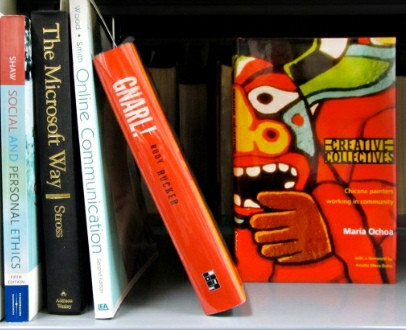 A. I work at King Library’s Cultural Heritage Center, which houses the U.S. race and ethnic materials (Africana, Asian American, Chicano, and Comparative Ethnic Studies). So you’ll see collections with books that students can check out. My job is somewhat different from others in that I’m purchasing materials to provide a vision for these special collections. My hope is that students will be able to find topics that not only interest them but also “speak” to them. You want the collections to connect to them so that they can write that research paper. What I do, be it through the comics or books, is help students to succeed in that effort. Through my collections, I’m hoping they connect. Alone, comic books may serve of little scholarly value but put scholarly books in the mix and you can get a research paper. Comics have come a long way, and it’s also not just Latinos who are actively producing these works. It has become an outlet to present the U.S. ethnic experience in another voice. Q. Was it hard to convince the library to collect Latino comics? A. These are things that are left to the librarian to pick and choose, depending on what you think is important, and it’s also a question of what’s being taught. You hope there’s going to be interest and you’re reacting to what you see as growth in the field. It’s a treasure for San Jose to have this start-up collection. 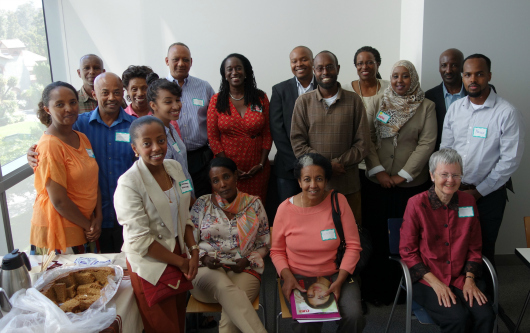 The Silicon Valley East African Diaspora Project represents immigrants from six nations: Eritrea, Ethiopia, Kenya, Somalia, Sudan and South Sudan (Michael Cheers photo). The uncertain future of the diversity visa program and a novel online timeline tool are heightening interest in a new King Library exhibit sharing immigration stories of Silicon Valley’s East Africans. But equally important is the way “Celebrate!” tells the story of an immigrant experience familiar to so many in the South Bay, perhaps the most ethnically diverse community in the nation. The show opens Aug. 31 and continues through Sept. 29 at the Jennifer and Philip Di Napoli Gallery on the second floor of King Library. Expect photojournalism, digital technology, films, cultural memorabilia, and text to introduce immigrants from six East African nations: Eritrea, Ethiopia, Kenya, Somalia, Sudan, and South Sudan. “‘The exhibit will increase the visibility of our region’s East African immigrants and their contributions to its economic, cultural, religious, and intellectual growth,” said Project Director and Professor of African American Studies Ruth P. Wilson. 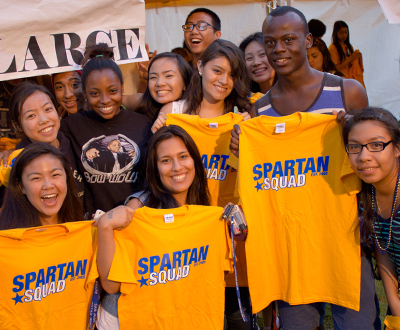 Here are more details from SJSU’s Silicon Valley East African Diaspora Project. Along the surfaces of seven gallery walls will hang portraits of East Africans engaged in work, family life, community events and faith. Most poignantly captured is the intensity of the commitment of persons engaged in collective worship activities, family life and work. Whether in an evangelical healing service, a mosque or a Coptic church, immigrant communities of faith seek meaning in their new home away from home, find hope as they work to survive and thrive, and find comfort in celebrating the cultural rituals that make life more meaningful for individuals and families. They consistently strive to support family members here, and in their home countries, who depend on them for some of the basic necessities: food, shelter, school fees, medicine, hospital care and funeral expenses. This collection of more than 50 photographs by photojournalist Associate Professor of Journalism and Mass Communications D. Michael Cheers captures the similarities and diversities of gendered, ethnic, religious, socio-economic and family experiences in these East African diaspora communities. TimeShaker, a Silicon Valley start-up, presents a new way to tell our immigrants’ stories. “What was the sequence of events that brought you to the U.S.?” and “What were the key events that have happened since arriving?” View these immigrants’ stories on a timeline, and overlay other pieces of history such as the history of their homeland or the history of U.S. immigration policies. Visit TimeShaker’s online portal to read the rest of the stories using an interactive, digital storytelling tool. across from the main exhibit. Each film addresses important issues for immigrant communities in the valley, in their home countries, and in diaspora communities throughout the world. Scholars and community activists will lead the discussions and panels after the screenings. Six display cases will be dispersed throughout the exhibit, one for each of the six East African nationalities represented in the exhibit. Each case will contain cultural memorabilia treasured by immigrant communities. While viewing jewelry, beaded objects, woven tapestries, stoneware, religious relics, carvings, coffee pots used in coffee ceremonies, cooking utensils, prayer beads, etc., visitors will realize the homogeneity and diversity of some of humanity’s most ancient human civilizations and cultures. participation in the selection of candidates for office, and the right to vote. Featured are East Africans’ thoughts on the promise of democracy and their hopes for more opportunities offered in the Valley and in their distant homelands. When Africa calls, East Africans answer. They travel throughout California, the nation and abroad for worship, weddings, sporting events, funerals, graduations, birthday parties, christenings, and feasts. Participating community organizations include: Bay Area Somali Association, Bay Area South Sudan Association, Eritrean Community and Cultural Center of San Jose, the Eritrean Community Center of Santa Clara, and the Ethiopian Cultural and Community Center. Sponsors include the African Women’s Development Fund USA and the Cal Humanities California Documentaries Project. Ten years ago, when the Dr. Martin Luther King, Jr. Library on the grounds of San Jose State opened its doors, it was the only example nationwide of a city and university coming together to co-develop and co-manage a library. And not just any library, but a crown jewel, with distinctive architecture and art installations designed to inspire learners from all walks of life in a valley whose hallmark is innovation and education. So when library officials set out to produce materials celebrating the 10th anniversary of the city-university partnership, they sought artwork reflecting the library’s unique attributes. For this, they turned to a very talented group of SJSU art students under the instruction of Professor Gale Antokal. Their assignment? To paint the library from their own perspectives as students and patrons but to also weave in the city-university connections, the pathways from the city onto campus and vice versa. The result is these gorgeous watercolors, which adorn street banners and posters getting the word out about the kickoff for the month-long celebration. President Mohammad Qayoumi will join Mayor Chuck Reed 11 a.m. Sept. 5 in the the lobby of King Library, born of a partnership that remains unique a full decade later. “Picturing Our Library: Watercolors by SJSU Art Students,” an exhibition featuring 18 of the student watercolors, opens Sept. 3 on the fourth floor, and will continue through the end of the month. Rendered this spring, these paintings captures the remarkable vantage points of interior and exterior landscapes of the King Library. Learn more about the King Library 10th Anniversary Celebration. The view from the SJSU Student Learning and Research Commons (Elisabeth Thomas photo). Are you a student looking for a comfortable place to work on a research paper, where you can borrow a computer and get help from a librarian? Then you might want to check out the SJSU Student Learning and Research Commons at the Dr. Martin Luther King Jr. Library. 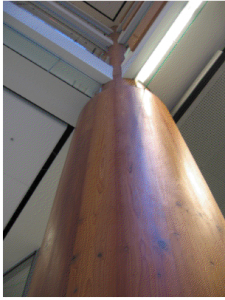 A grand opening and dedication will be held 1 p.m. Jan. 31 in the space, which is above the Children’s Room. “This new space brings technology and support together in one physical place, and it will continue to grow and change as technology and student needs grow and change,” said Provost and Vice President for Academic Affairs Ellen Junn. The commons also offers a glimpse of the future for libraries. Need a printer or wifi? No problem. 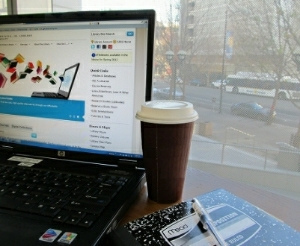 Both will be available at the commons, along with desktops, laptops and iPads. You’ll also find meeting space with whiteboards for group projects. And in case you’ve got a question, library staff will be right there for research and technical support. You’ll need your Tower Card to get in. This commons is for SJSU only. On Jan. 31, everyone will be treated to complimentary coffee and hourly giveaways. For the rest of spring term, the commons will be open 11 a.m. to 7 p.m. Monday through Thursday, 11 a.m. to 6 p.m. Friday, 10 a.m. to 6 p.m. Saturday and 1 p.m. to 5 p.m. Sunday. 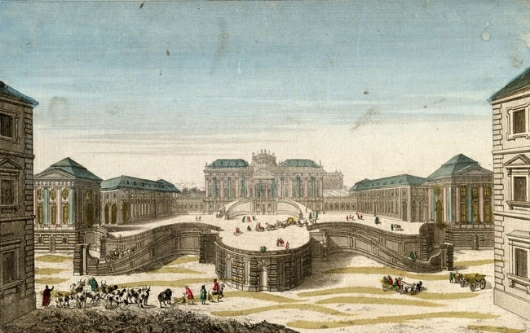 Hand-colored, perspective-view engraving of the Schwarzenberg Palace (courtesy of Ira F. Brilliant Center for Beethoven Studies). Engravings of battle scenes and palaces. A Viennese cookbook from 1803. A zograscope and vue d’optique prints. A lock of hair. A quill pen. Music manuscripts. Period instruments. What do these items have in common? They allow us to look into the years between 1792 and 1827 when Ludwig van Beethoven lived and worked in Vienna. “Beethoven’s Vienna – Music-Making, Machinery and Technology, the Imperial Capital and Its Surroundings, and Everyday Life” opens Jan. 26 at the King Library Special Collections exhibit hall and Beethoven Center. The exhibit is free and open to the public through May 25. 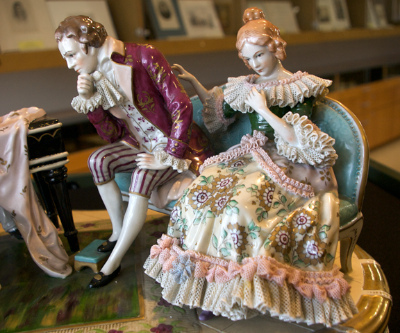 The pieces were curated by the Ira F. Brilliant Center for Beethoven Studies. The center is the only institution in North America devoted solely to the life, works and accomplishments of Ludwig van Beethoven. Established in 1983 when Ira F. Brilliant donated his Beethoven collection to San Jose State, the center officially opened in September 1985 with a gala co-sponsored by the San Jose Symphony. Building on Brilliant’s original donation, the center now has the largest collection of Beethoven materials outside of Europe. 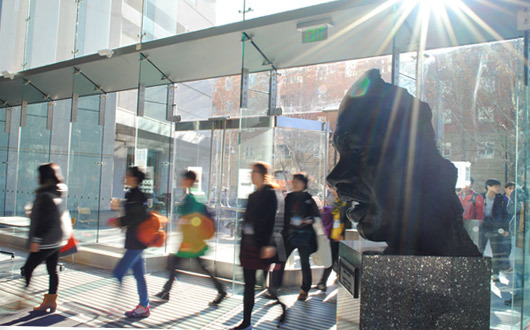 In addition to functioning as a research library and museum, the center is involved in a variety of educational programs and sponsors concerts, lectures, tours, and other events. 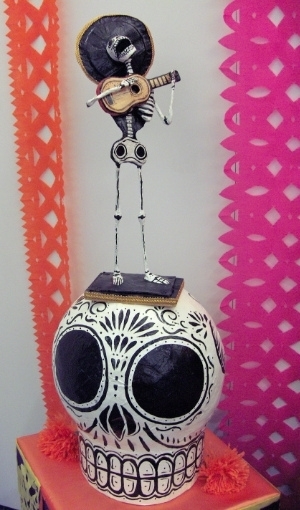 “Day of the Dead 2012: The Art of Remembrance” exhibit continues through Oct. 31 at the DiNapoli Gallery on the second floor (Elisabeth Thomas photo). An event celebrating SJSU book authors, new databases for scholarly research, an information literacy skills symposium, the Affordable Learning Solutions initiative and upcoming events (including “Day of the Dead 2012: The Art of Remembrance” exhibit through Oct. 31 at the DiNapoli Gallery on the second floor) are among the many topics covered in the latest issue of King Library’s “Academic Gateway” newsletter. It’s oriented toward the faculty, but it’s a great resource for everyone. Check it out now [PDF]. RSVP by Nov. 1 if you would like to attend the SJSU authors event 3-5 p.m. Nov. 5 in King 225–229. The Office of the Provost, University Library and Spartan Bookstore are jointly hosting what they hope will become an annual celebration. 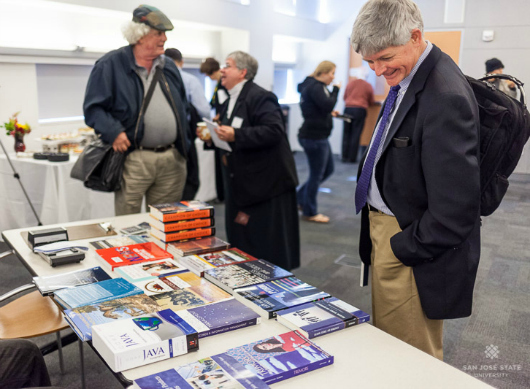 Faculty and staff members who have recently published a book will be honored. Their work includes scholarly books, fiction and nonfiction, poetry, art and textbooks, anthologies and edited books. Philip Ahn, the first Asian American actor to receive a star on the Hollywood Walk of Fame, is one of 10 individuals featured in King Library's “The Lives and Contributions of Pioneering Korean Americans” exhibit. “The Lives and Contributions of Pioneering Korean Americans” exhibit at the Dr. Martin Luther King Jr. Library showcases ten individuals who have made outstanding and significant contributions to the community and their professions. 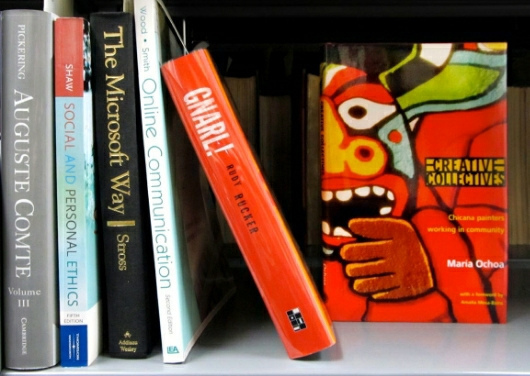 A bibliography is also provided for further study on those people’s lives and Korean American. The featured individuals are Philip Ahn, Judge Herbert Choy, Philip Jaisohn, Yanghill Kang, Harry Hyung-Soon Kim, Willa Kim, Young Oak Kim, Sammy Lee, Nam June Paik, and Grace Lyu-Volckhausen. 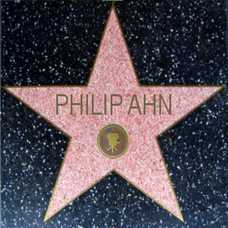 Philip Ahn is the first Asian American actor to receive a star on the Hollywood Walk of Fame. Judge Herbert Young Choy is the first Asian American judge named to a federal court and the first Korean American to be admitted to the bar. Philip Jaisohn is the first Korean to be naturalized as an American citizen and the first U.S.-educated Korean to receive a medical degree. 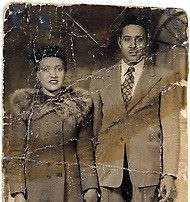 Dr. Jaisohn was a physician, civil servant, political activist and newspaper publisher. Younghill Kang is known as the father of Korean American Literature. Willa Kim is the first Korean American to win Tony and Emmy awards for costume design and was inducted into the Theatre Hall of Fame in 2007. Colonel Young Oak Kim is the first Asian to lead an Army division and was a highly decorated World War II and Korean War veteran. Sammy Lee is the first non-white American-born Asian to win an Olympic gold medal in diving. He is a physician. Grace Lyu-Volckhausen has been a community activist and advocate for immigrants for over 35 years. Nam June Paik is the father of video art. The display runs through May 30 at the Cultural Heritage Center exhibit area on the fifth floor, and is one portion of the university’s Asian and Pacific Islander Heritage Month celebration. 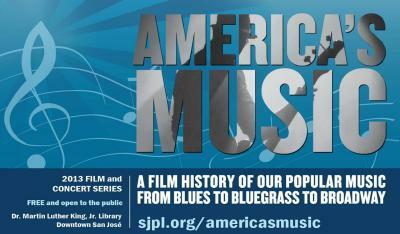 Sponsors include the Asian American Advisory Committee, Cultural Heritage Center and King Library. 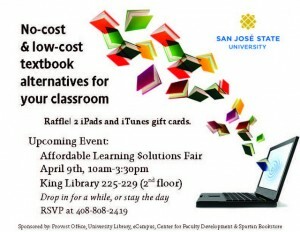 The Affordable Learning $olutions Fair at 10 a.m. to 3:30 p.m. April 9 in King Library will kick off the university’s initiative to work as a community to help lower the costs of textbooks for SJSU students. 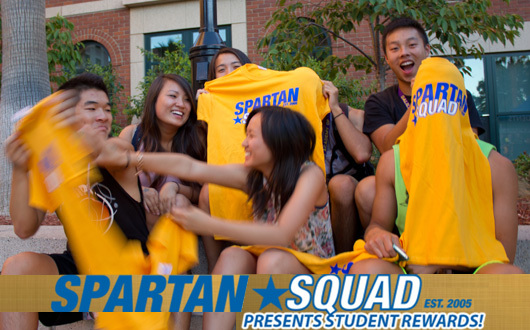 The SJSU bookstore estimates that on average students pay up to $1,700 per year on textbooks. This is an enormous financial burden for students who must balance the higher cost of student fees, textbooks, groceries, and other living expenses. This daylong event will identify ways that the faculty can help keep the cost of course materials affordable for students. 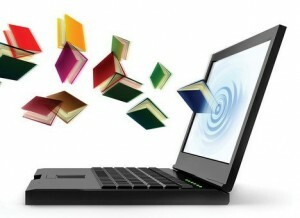 Attend and learn about ways to utilize technology to create interactive learning resources or to adopt ebooks that may be available freely to students via the library. The program for the day is below. All faculty members and students are invited to attend for part of the day or for the entire day if you are available. Lunch will be provided by the Spartan Bookstore and two iPads and several iTunes gift cards will be raffled during the course of the day. A special thank you to the Spartan Bookstore for its generosity. Please RSVP by Friday, April 6 to (408) 808-2419 or bridget.kowalczyk@sjsu.edu. 10 a.m. – 10:15 a.m.
1:55 p.m. – 2:40 p.m.
Henrietta and David Lacks, circa 1945, from "The Immortal Life of Henrietta Lacks." The Dr. Martin Luther King Jr. Library is hosting a wide range of events and exhibits in celebration of Black History Month. Dr. Ruth Wilson, SJSU professor and chair of African-American Studies, will present “Genes, Guts and Grit: The Legacy of Three Extraordinary African-American Women” at noon Feb. 29 in King 225/229. Wilson’s research focuses on African-American women and the new black diversity in the African-American community. Her lecture will provide an overview of three women “she-roes” in American history: Lucy Terry Prince, Maria Stewart and Henrietta Lacks. Their contributions add texture to the characteristic descriptions of the 18th, 19th and 20th century American woman. Many of us go to the library to borrow the latest movie or newest bestseller, but did you know King Library also houses items that are over 100 years old? The California Room is home to two sculptures by 19th century African-American and Chippewa-Indian artist Edmonia Lewis. To learn more about these sculptures, attend the open house at 6 p.m. Feb. 15, when local expert Mary Parks Washington will discuss the artist and her work. SJSU’s Burdick Military History Project will present artifacts from one of the nation’s largest private collections at “The Price of Liberty: Artifacts of African-American Military Service,” an exhibit at the Cultural Heritage Center on the fifth floor of King Library through Feb. 29. Curator Antony L. Powell is a San Jose-based historian who for three decades has been studying, teaching, collecting and writing about America’s “buffalo soldiers,” the first peacetime all-Black regiments in the regular U.S. Army. View more info on related events. The greatest need is for books that interest children ages 7-13. Partners in Reading enriches the lives of adults through reading, writing, technology, life skills, critical thinking, as well as English language learning, equipping them to achieve their goals and participate more fully and with greater confidence in all areas of their lives. Partners in Reading (a unit of the San Jose Public Library) features a family literacy program, Together We Read. As you know, the intent of family literacy is to break the cycle of low literacy that is passed from one generation to another. Each child raised in a family with low literacy has a 50 percent greater chance of not being literate. Through family literacy, we work with adult learners who care for and live with children – parents, grandparents, caregivers and others – to help them understand their very important role in teaching and developing literacy skills in their children. One of the most important ways to ensure literacy in a child is to read aloud to them every day and read together as a family. In order to do that families need books and home libraries. Through Together We Read family literacy, children are given books to spark their imagination and develop those literacy skills. Partners in Reading gives new, colorful selections to children that entice and engage them. One of their favorite activities is scanning the new books that are available and selecting just the right one with beautiful images and an exciting story. You can tell when they have found that special book as their eyes widen and they freeze in place as they slowly turn the pages in anticipation. During this season of giving, we ask for your support. Partners in Reading is sponsoring a new children’s book drive just for those in the family literacy program. 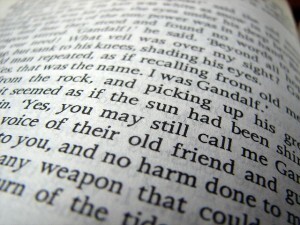 The range of children we now serve in Together We Read is from birth to 13 years of age. Whether you select a board book for an infant or a picture book for a toddler or a chapter book for a child in elementary school, it will be appreciated. These new books will be distributed to families throughout the year and for many it may be the first book they own. Our greatest need is for books that interest children ages 7-13. Below are links to book lists that would interest a number of age groups. The book drive ends Friday, January 20. Drop books off at the service desk of any San Jose Public Library branch or the Partners in Reading office at King Library. We so appreciate the support you have contributed throughout the year and your generosity with the program.